Deviating from my regular grungy style of doors, today’s Thursday Doors entry is not plain nor ordinary, but rather stylish in its own way. That is gorgeous and the leaves are the perfect addition! Wow, the color of the door and the flowers is such a great combination. Gorgeous photo and I love photographing doors too. Thank you Lisa, you should click on the link and check out Norm 2.0, maybe you would enjoy participating to Thursday Doors every week. 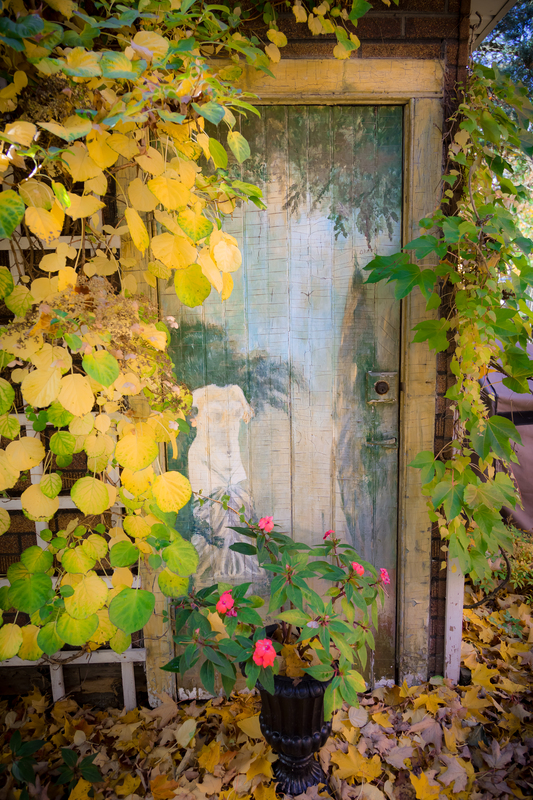 It’s lovely, the colours, the painting on the door, the foliage around it, the leaves on the ground… it almost looks staged! Oh, yes the flowerpot completes it!